A solitary tree stands strong against the winter in Wensleydale, the Yorkshire Dales National Park. 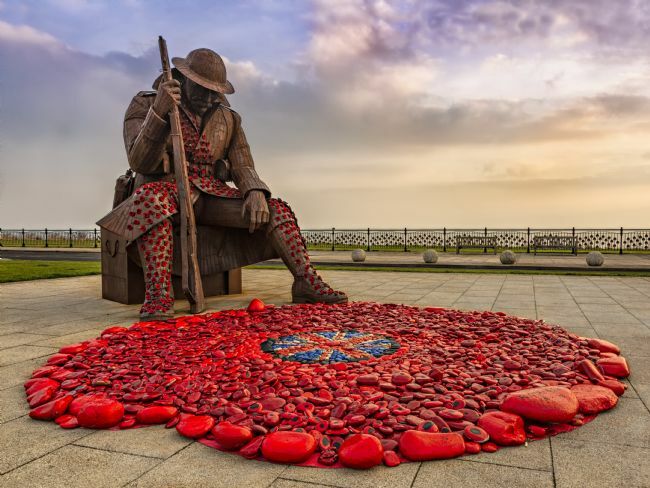 Located on the road from Hawes to Ingleton close to Ribblehead. In the distance can be seen the summit of Ingleborough Top, one of the Yorkshire Three Peaks. 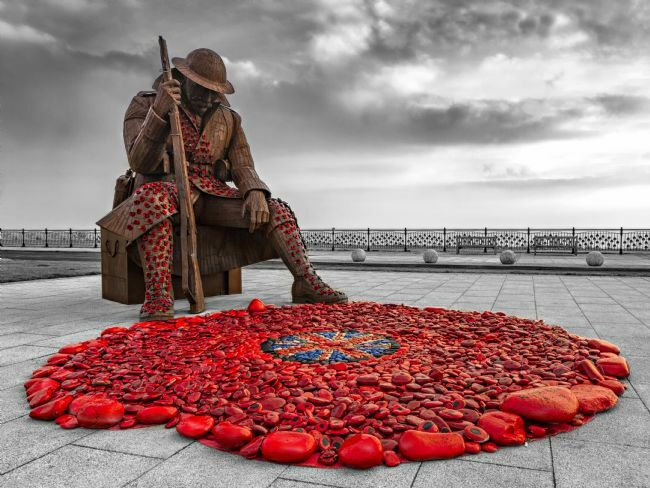 All around the rabbit tracks dart between the rocks. Tarn Hows is a picturesque tarn located in the Lake District of England, close to Hawkshead and Coniston. The tarn itself is fed by run off from a series of valley and basin mires at its north end, drawing out via Tom Gill and a number of small waterfalls to Glen Mary Bridge. Looking out from White Cross bay, across Windermere towards the sun as it sets behind the rise of Scale Head and Latterbarrow. Looking out across Windermere at the setting sun as it disappears behind the rise of Scale Head and Latterbarrow, casting stunning light onto the high clouds. Looking out over Tarn Hows towards Coniston Water, from the slopes of Arnside Intake, in the English Lake District. Standing above Tarn How and Coniston Water on Arnside Intake, looking across the fells to Birk Fell, Ambleside. 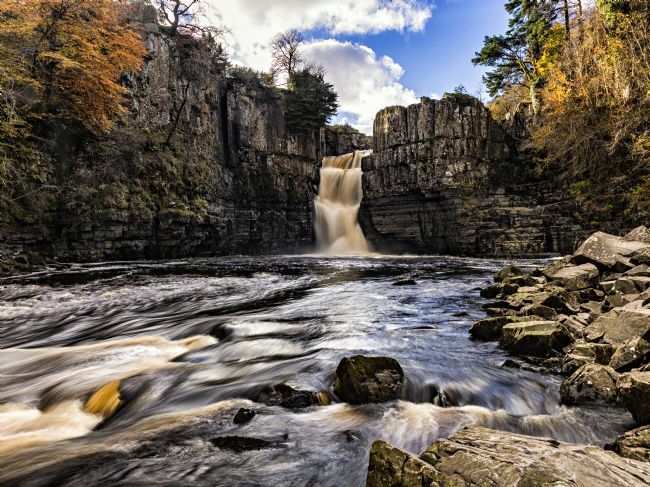 High Force is located on the Ricer Tees, within the Teesdale, County Durham, close to the village of Middleton in Teesdale. The Tees plunges 71 feet over the falls, flowing onwards to the Low Force falls further down-steam. The waterfall is affected by the release of water from the Cow Green reservoir located further up-stream. The High Force waterfall is fed by the River Tees as it flows through Teesdale, County Durham, from the area of the Cow Green Reservoir. The Tees tumbles 71 feet over the falls as it works its way down stream to Low Force and passed the village of Middleton in Teedsale and eventually on to Teeside. 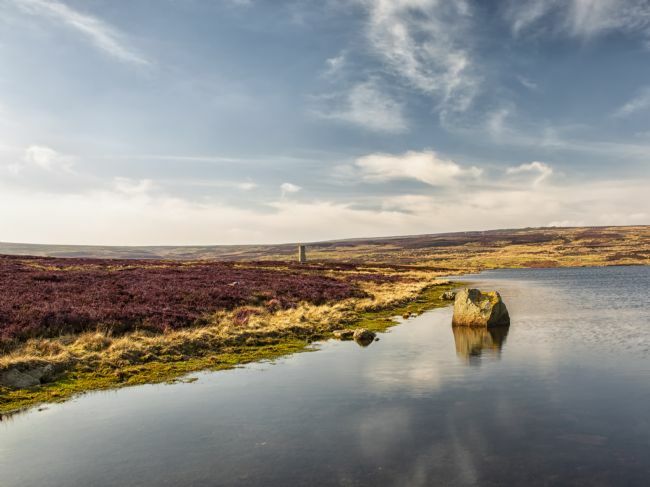 The Hisehope Reservoir, in County Durham, is the smallest of three reservoirs that are located on the area of Mugleswick, Stanhope and Edmundbyers Commons, bordering onto the North Pennines area of outstanding natural beauty. 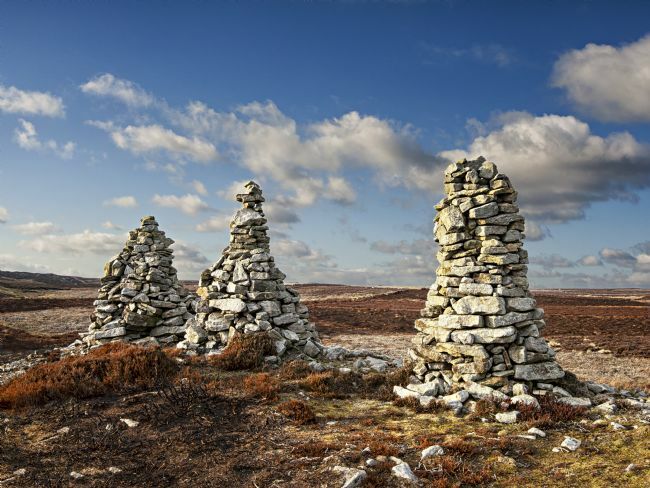 The Three Curricks are three stone cairns that are located on the Muggleswick Common, between the tiny village of Muggleswick and the slightly larger village of Edmundbyers, in County Durham. The area borders onto the North Pennines area of outstanding natural beauty. 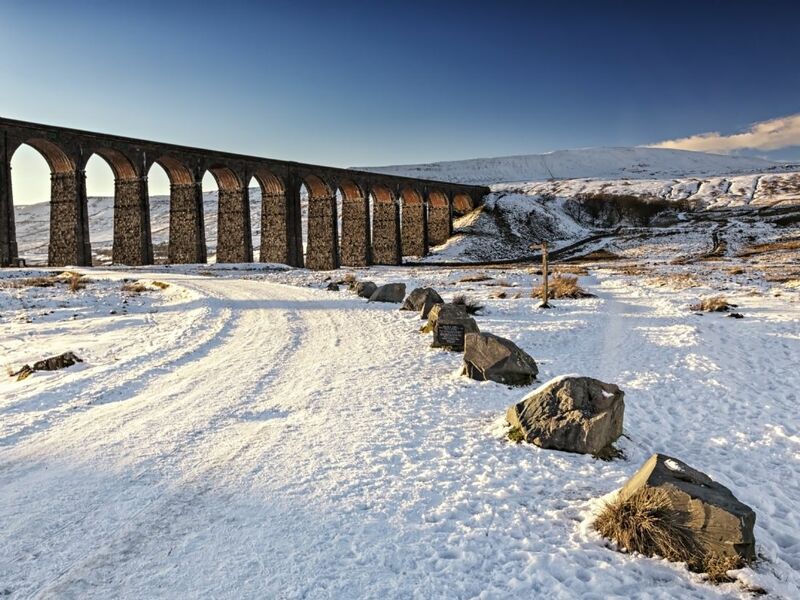 Dent Head Viaduct was built between 1869 and1875 for The Midland Railway Company. Now part of the Settle - Carlisle Railway. It has 10 arches, is 100 feet high and 199 yards long. 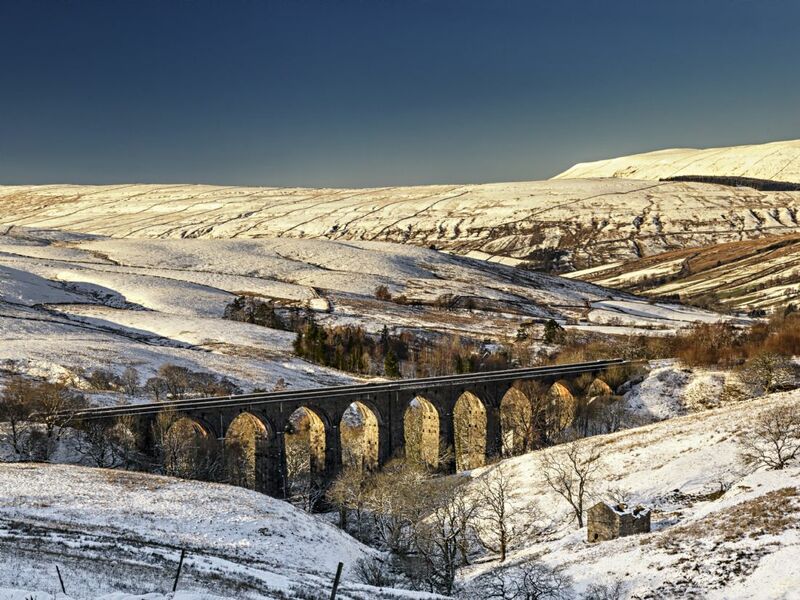 Located in Dentdale in the Yorkshire Dales, it is located between the better known 24 arch Ribblehead Viaduct and the lesser known 11 arch Arten Gill Viaduct. A lone oak tree ringed in protective drystone walling, standing proud on the snow covered military ranges close to Leyburn and Richmond in North Yorkshire. Looking out across the snow covered fields in Richmondshire, North Yorkshire towards Horgra Hill and the fells. The Yorkshire Dales, an area of outstanding natural beauty, lies covered in a blanket of snow. 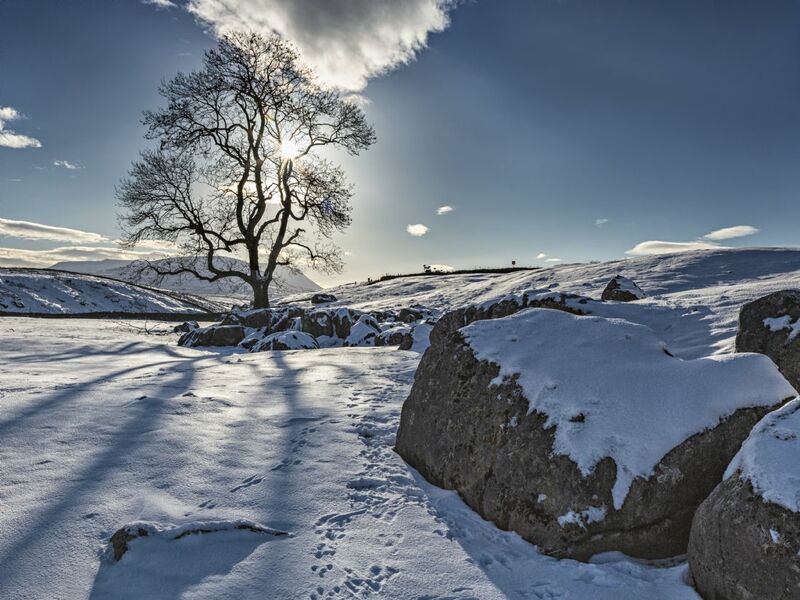 Three bare trees in the foreground provide an image of the starkness of winter and the drystone wall leads the eye out across the beautiful and enticing fells. Grassholme reservoir is one of a number of reservoirs located in the Lune Valley of County Durham, located close to the village of Middleton in Teesdale. The reservoir supplies water to Teesdale and teeside. Cronkley Scar rises from Cronkley Meadow in Upper Teesdale and runs adjacent to the start of the River Tees. Looking east into the low brilliant sun, the river, that is fed by the Cow Green Reservoir which itself is in close by County Durham, travels towards both High and Low Force waterfalls. The River Tees runs alongside Cronkley Scar in Upper Teesdale, close to the border of Weardale and County Durham. The area of cliff is known as Falcon Clints. 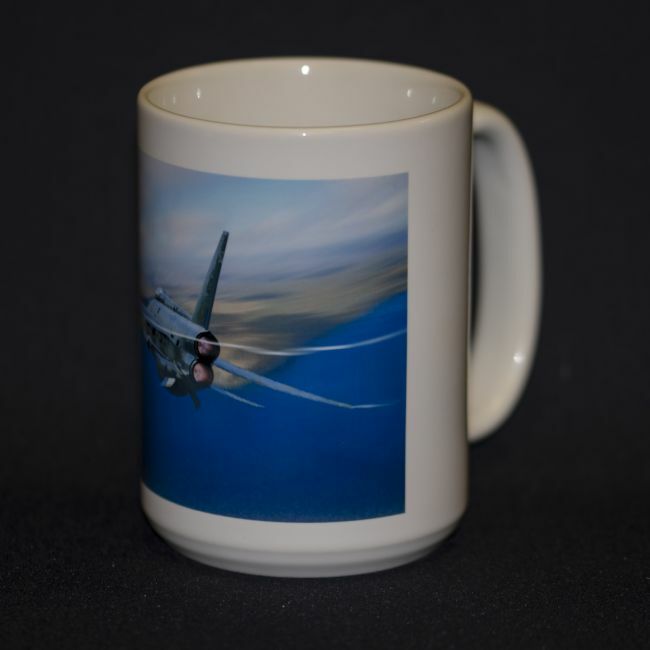 The image is taken downstream from the Cow Green Reservoir that is located in County Durham, but feeds into the Tees. In the distance the mist is just beginning to clear from the valley. Cow Green Reservoir is located in County Durham, but feeds the River Tees. The water is released at times of low rainfall and hurtles a short distance from the dam, and falls into the River Tees from the Cauldron Snout waterfall. 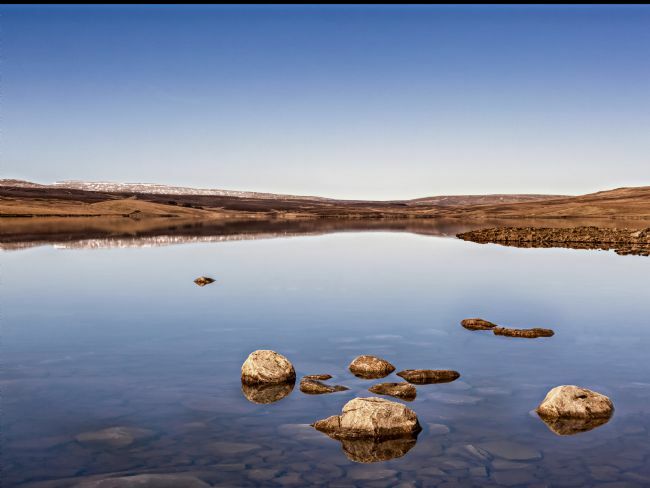 Cow Green Reservoir, located in County Durham, close to the North Pennines and area of outstanding natural beauty and is one of the highest placed reservoirs in England. In the distance are the Little Dun and Cross Fells, some 10 km away. The reservoir feed the River Tees and water is released in dry periods downstream to Teeside. A war-weary Tommy sits thoughtfully, head bowed, rifle in hand, as he reflects upon the sheer horror of World War One during the first minute after peace was declared in 1918. 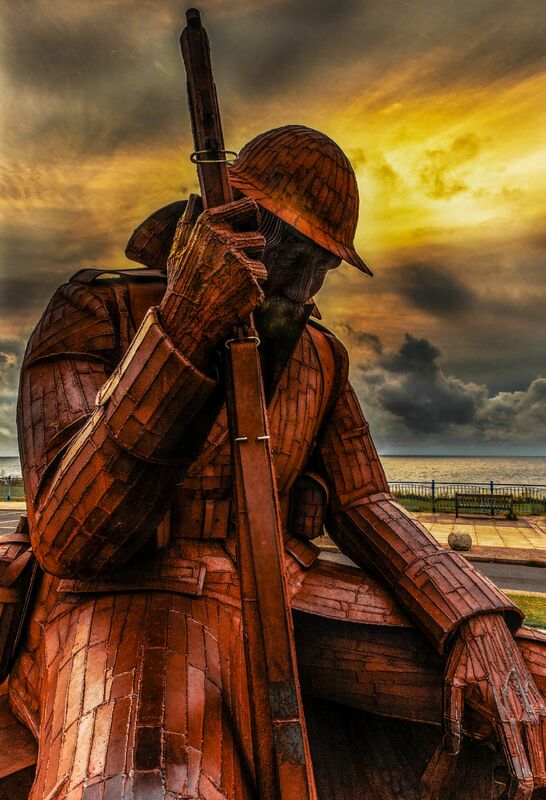 This imposing metal sculpture, entitled 1101, owing to the fact the armistice went into effect at 11am on November 11, 1918, stands 9ft 5ins tall and weighs 1.2 tonnes. 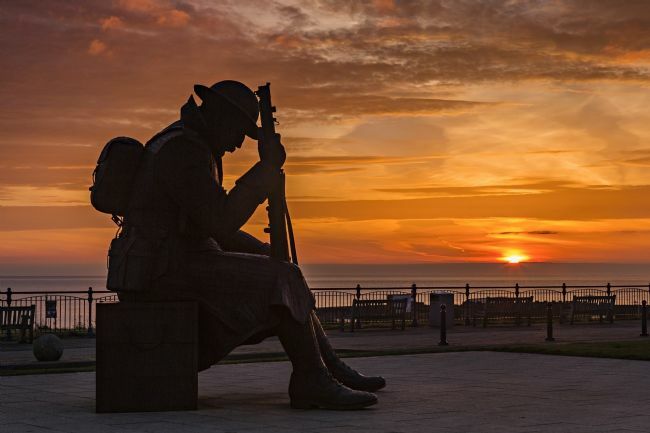 Built out of special corteen steel, it has been installed on Seaham seafront in Country Durham to mark the centenary of the start of the Great War. 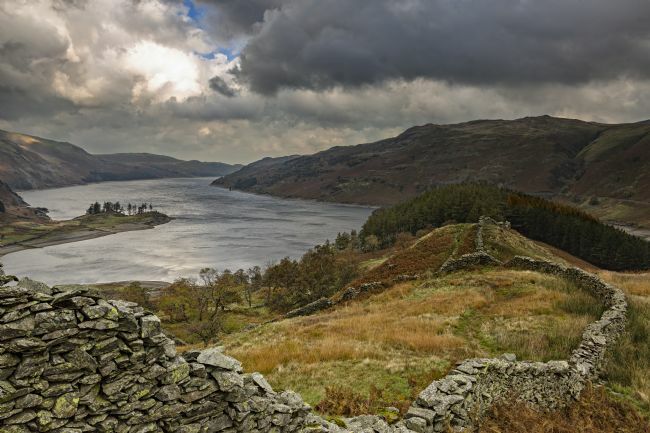 An image of Haweswater in the English lake District, captured after a rain storm had subsided. The view north along the lake, takes in Mardale Common to the right and Bason Crag and Whelter Bottom to the left. A view into Haweswater, a lake in the English Lake District, looking northwards towards The Rigg. 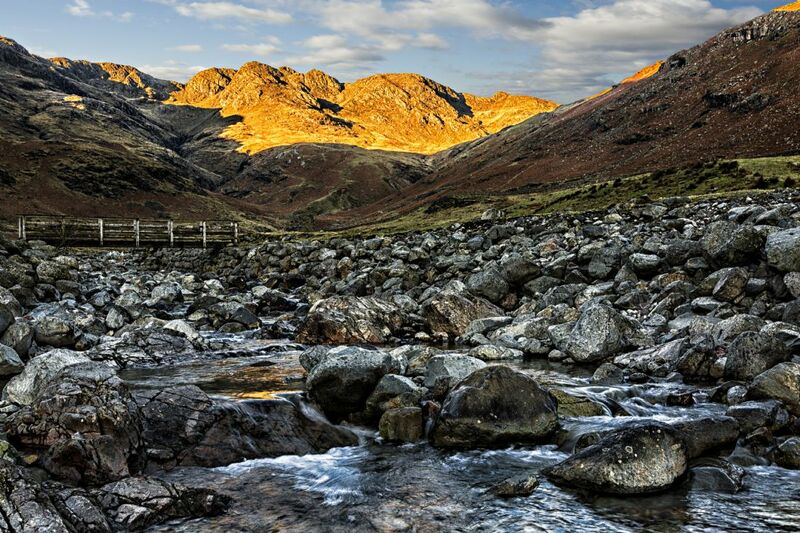 The autumnal colours beginning to show on the fells and a low water table after a very dry summer. Looking north from The Rigg across Haweswater in the English lake District. 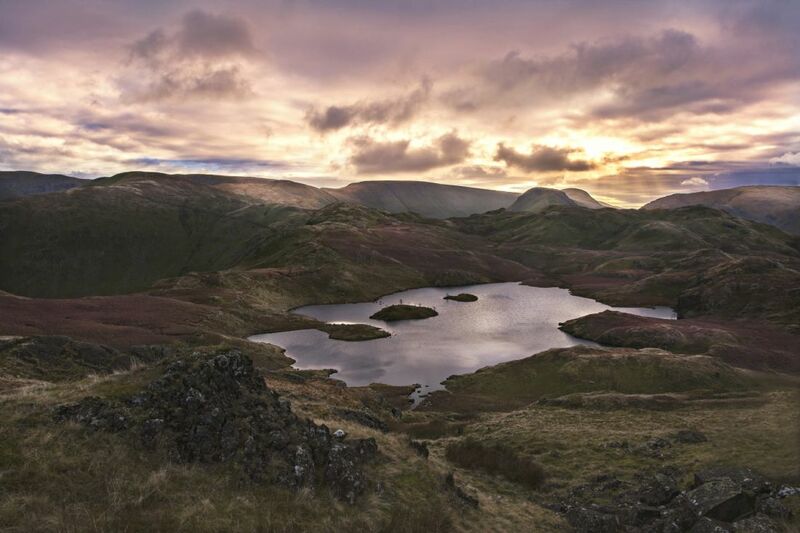 The lake is, bordered by Mardale Common, Bason Crag and Whelter Bottom. The autumnal colours being to show on the hillsides. 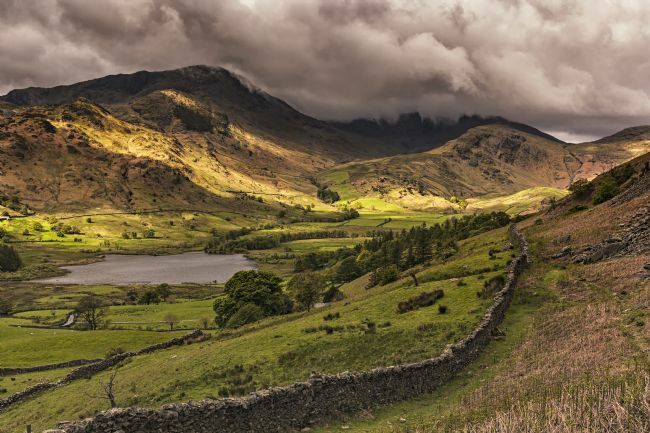 Place Fell in The English lake District is a hill that overlook who's western flanks overlook the lake of Ullswater and the villages of Patterdale and Glenridding. Located on close to High Street, the trig point is captured in the first snow of 2017 with distant views of the snow covered Helvellyn range. A view over the English Lake District village of Patterdale, from the ascent unto High Street and place Fell, located on the western shore of Ullswater. Looking into the distance, the snow covered Helvellyn range, amongst others can be seen. View into Patterdale Village from across Goldrill Bridge, in the English Lake District. Ion the col, between Crinkle Crags and Bowfell, lies three tarns, which give the name to the area. This is the tan that sits next to Bowfell, it is not always present, but here, it is shown frozen. Looking out to the distance is Esk Pike out towards the Scafell Range. Looking down from the ascent to Sunday Crag a couple gaze along the beautiful Ullswater. Angle Tarn, located on the Angletarn Pikes, located near to Patterdale in the English lake District. The Tarn give its name to the pikes which surround it. Captured here as the sun is beginning to set, casting rays onto the pikes, lighting the area. 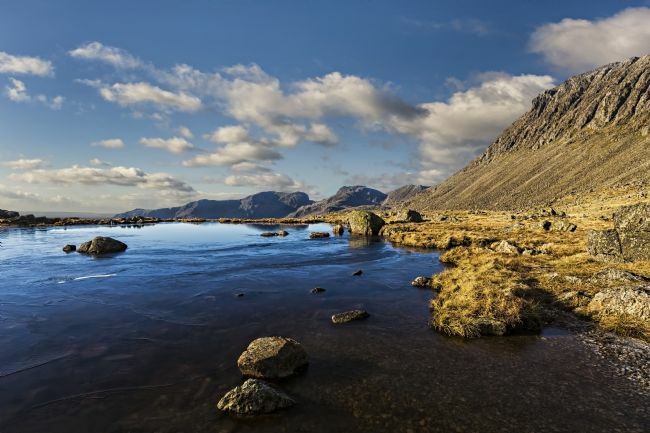 Innominate Tarn is located in the northern Lake District National Park. Located close to the summit of Haystacks, it is the location where Alfred Wainwrights ashes were scattered. 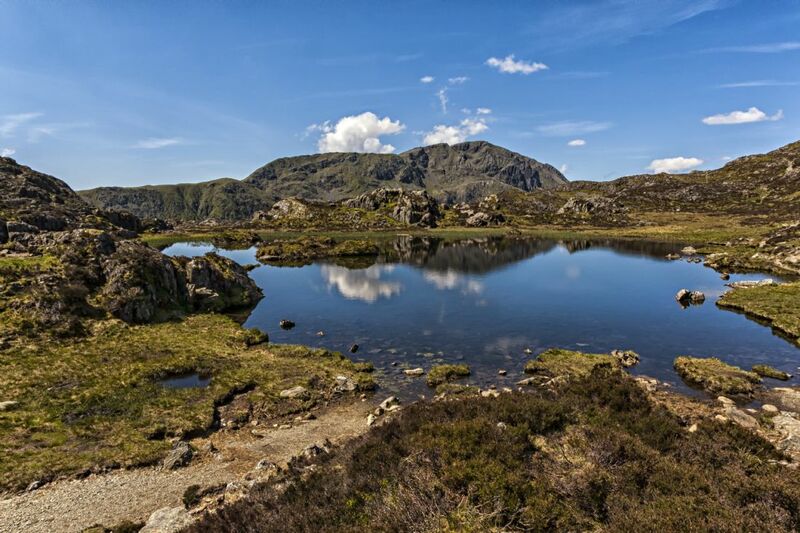 Innominate translates as without name although it was formerly called Loaf tarn. A view through a welcoming open gate onto the autumnal Ulpha Fell and across to Pike O'Blisco in the English Lake District. 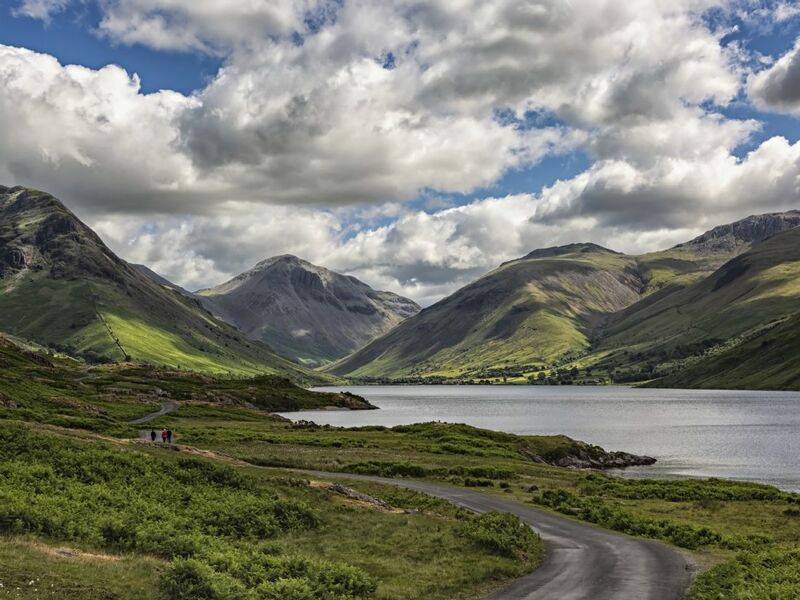 A view along to Wasdale head, looking over Wastwater towards the Scafell range of mountains. Looking along the Borrowdale Valley just as the light returns after a heavy downpour. A beautiful calm day at Derwentwater afforded the opportunity to pick up some lovely reflections of the Skiddaw mountain range reflected the the still waters. 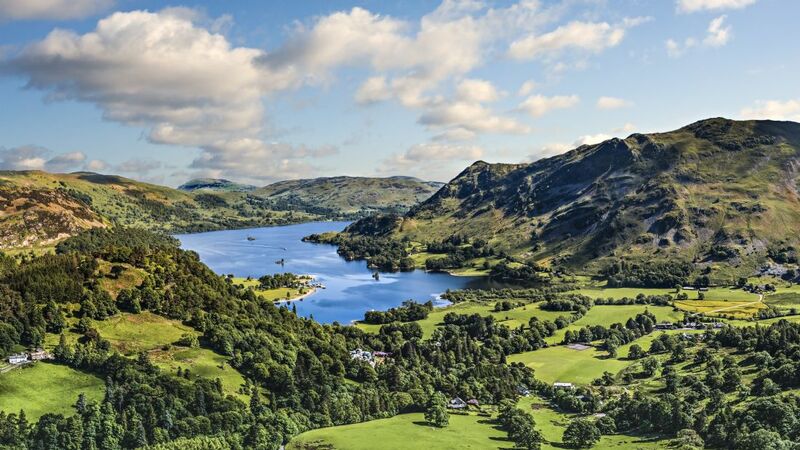 A summer view along Lake Ullswater as seen from the ascent to St Sunday Crag from Patterdale Village. Ashness Jetty is located on Derwentwater in the Borrowdale Valley of the Lake District., close to the town of Keswick. On a calm clear day, Derwentwater offers fantastic reflections of the surrounding hills and sky. 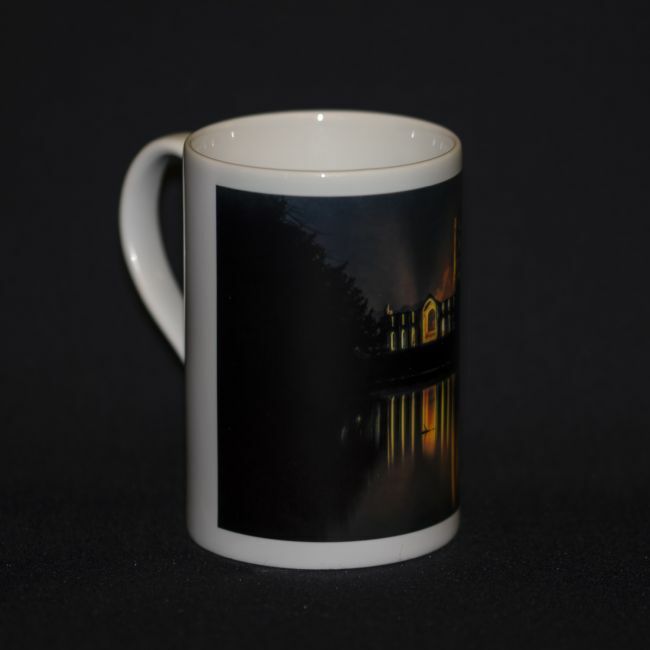 Views across to Catbells and other well known tops can be enjoyed from this great location. 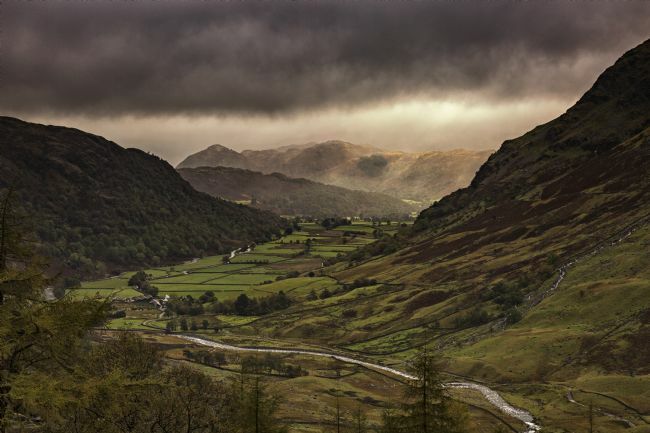 Above Ullswater on Place Fell, a stunning view of Hartsop and Brotherswater can been seen through the morning storm. The cloud and mist was being whipped by strong winds, snow beginning to fall and the sun was breaking through in intermittent bursts. A stunning location, given so much more by the atmospherics on the day. 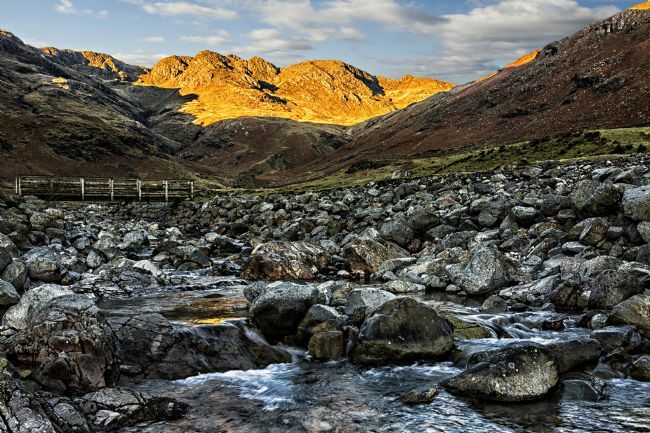 Crinkle Crags viewed from the start of the ascent at The Oxendale Footbridge, the morning winter sun casts a golden glow onto the Crinkles, and the light is just catching the Oxendale Beck. Little Langdale is a valley in the Lake District, England containing Little Langdale Tarn and a hamlet also called Little Langdale. A second tarn, Blea Tarn, is in a hanging valley between Little Langdale and the larger Great Langdale to the north.